Most queries use multiple tables, queries, or a combination of the two as the record source. The Query Wizard is the easiest way to build multi-source queries. When using multiple tables, make sure that they are related. Learn more about creating related tables. Click the Create tab, click Query Wizard. Select Simple Query Wizardand click OK. In the Tables/Queries list and click the first table you want to use. 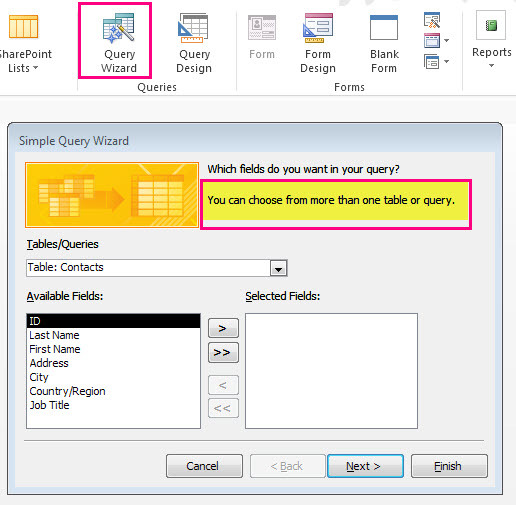 In the Available Fields pane, click the first field you want to use in the query and click . Repeat to add other fields from that table to the Selected Fields pane. Open the Tables/Queries list and select the second table or query. Important: The tables you use in this type of query must participate in a relationship, either directly or indirectly. Repeat step 4 to add fields from the second table and click Next. When you are done adding fields, enter a name for the query and click Finish. See how to limit the number of items in a query with multiple tables in Join tables and queries.